Based on Akira Kurosawa’s Seven Samurai, The Magnificent Seven easily adapts from samurai film to western, just as Yojimbo would easily be made into A Fistful of Dollars a few short years later. 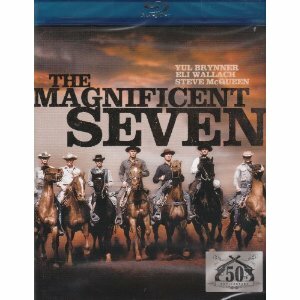 In celebration of the 50th Anniversary of this beloved western, The Magnificent Seven is available on Blu-ray for the first time. The epic film can now be enjoyed in perfect picture and sound. This landmark western was responsible for launching the careers of Steve McQueen, Charles Bronson and James Coburn, all of which are among the seven gunfighters who join forces to protect a small Mexican village from an army of bandits. They are led by Yul Brynner, who is responsible for rounding up the seven men willing to go up against 50 in a gunfight.